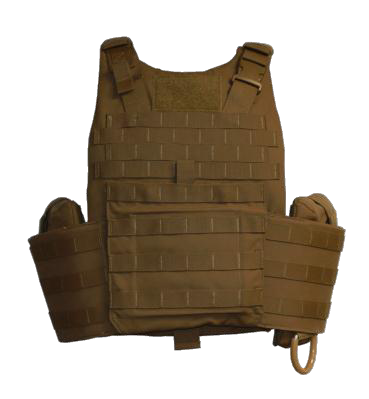 The Marine Corps Plate Carrier (PC) improves the load bearing capabilities of the scalable plate carrier, integrates primary components among the improved modular tactical vest, and contours the product for comfort and wear. The PC is designed to function with or without the Cummerbund and Cummerbund Side Plate Pockets, based on the user's desires. The base vest assembly has been redesigned to have a removable front and back ballistic insert and a removable waist belt assembly. The cummerbund assembly has been redesigned to consist of two interchangeable left and right sides, a left and right inner cummerbund, one cummerbund attaching stick and one quick release cable.